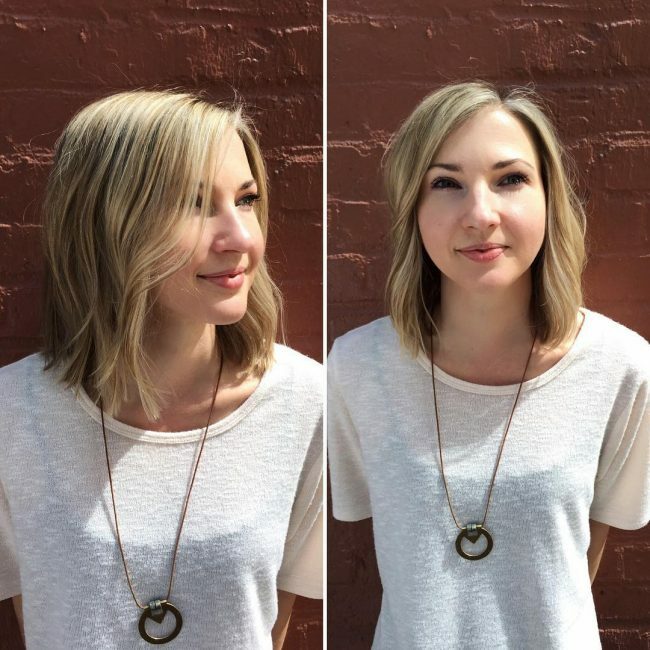 Most ladies prefer to call the long bob, the Lob. Regardless of what you call it, this is still one of the trendiest hairdos out there. It has been popular for quite some time, and it will continue to be for long. One of the reasons behind this is that it manages to flatter different complexions, face shapes and texture meaning that any woman can wear it and still look fantastic. It is a classic and universal headdress that will make you look modern, and it is also very versatile since you can style it in many ways. And the following 60 designs show just how versatile it is. The texture of these locks is one of the things that make them fabulous. However, this style would not look this beautiful without the hand painted dye job. 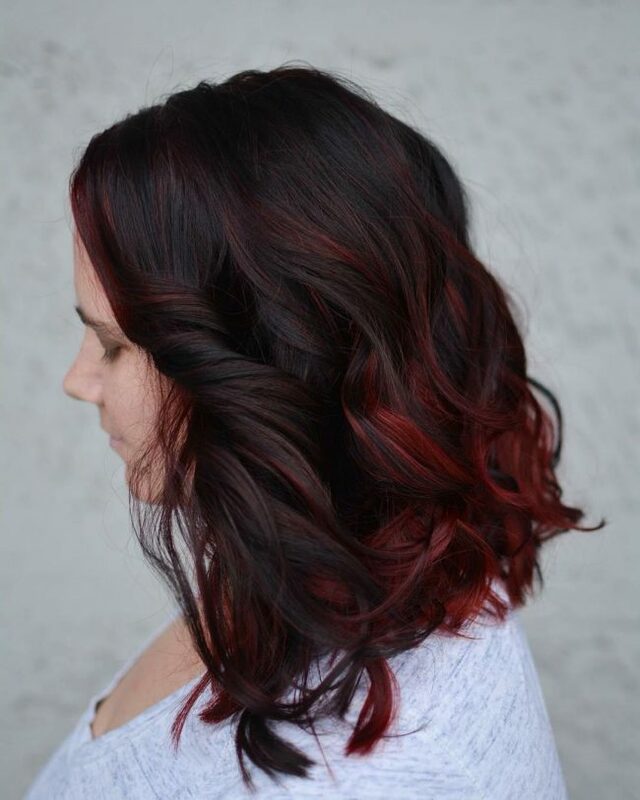 The dye job involves painting a burgundy shade on a black base in an ombre pattern. 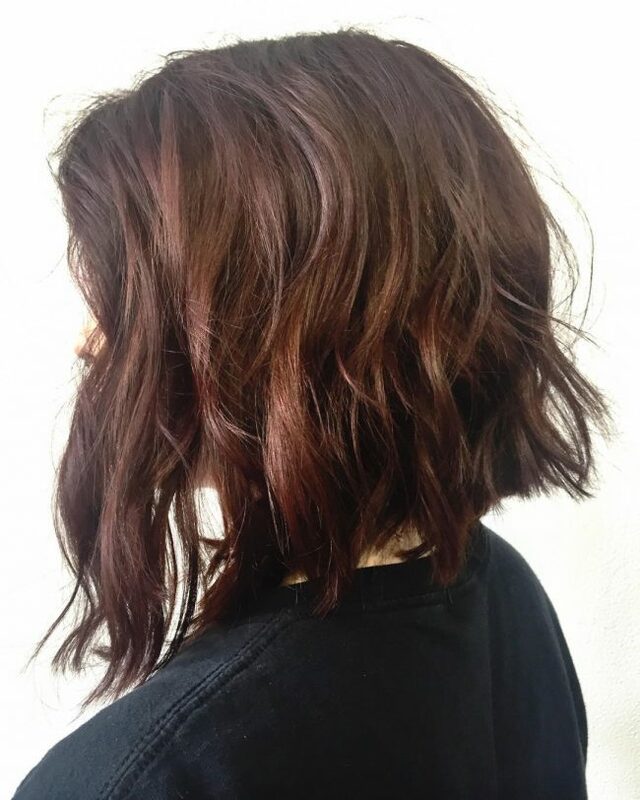 And this lovely shade adds some detail to the textured bob. 25 Gorgeous Rope Twist Styles With Braids — So Easy, So Elegant! Choppy hairdos are very easy to create, but they are also stylish if you cut them right. This particular one also has some subtle layers and a side part that makes it look marvelous. The blend of different shades of brown gives it the vibrant tone. Use of multiple shades in a headdress is a good way to create a dazzling look. Although this will give you an attractive look, you still need to have a good haircut for your style to stand out. And in this particular headdress, this comes from trimming some long wavy stands to give them some texture and styling them with moderate layering. 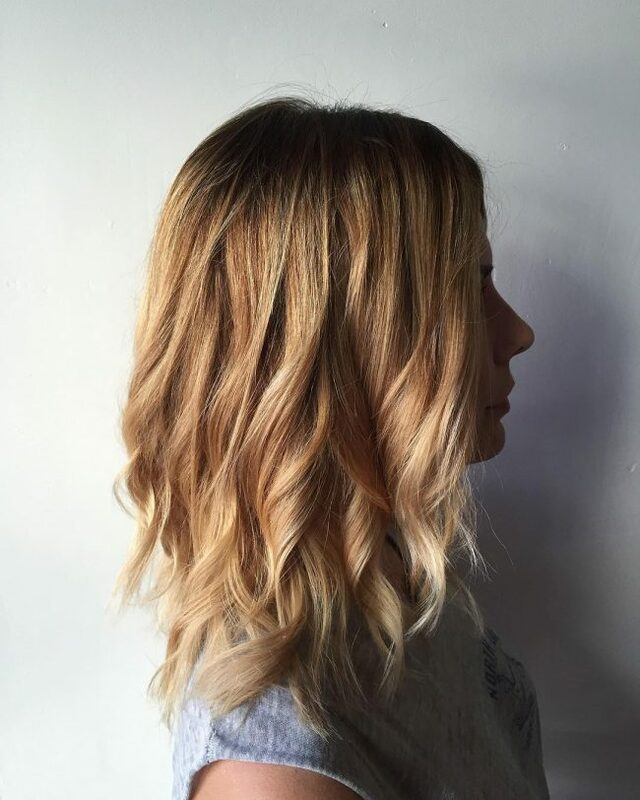 The golden blonde hue in this style is stunning, and it creates an incredible contrast with the slightly darkened roots. However, the haircut is what makes this a top notch headdress and it is a typical lob with some curly textured locks that you should style by layering. Although this style looks very fancy, it is easy to create if you have some long straight locks with a dark tone. In fact, all that you need to do is to trim the ends slightly for some uniformity and to make them edgy. You should then finish the look with a side part and by sweeping the strands to the sides. 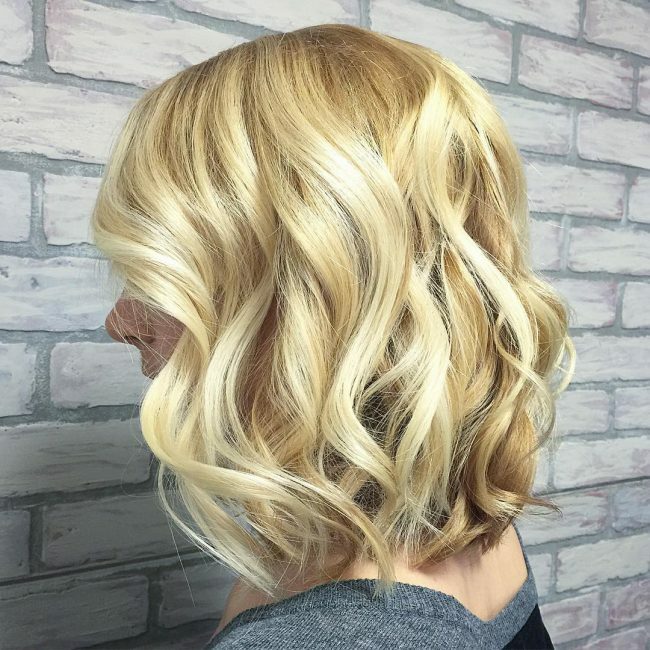 This Bob has a very simple cut that involves leaving a front fringe at the front and the rest of the strands flowing to the back in a wavy pattern. However, the color and the styling make it look very classy. 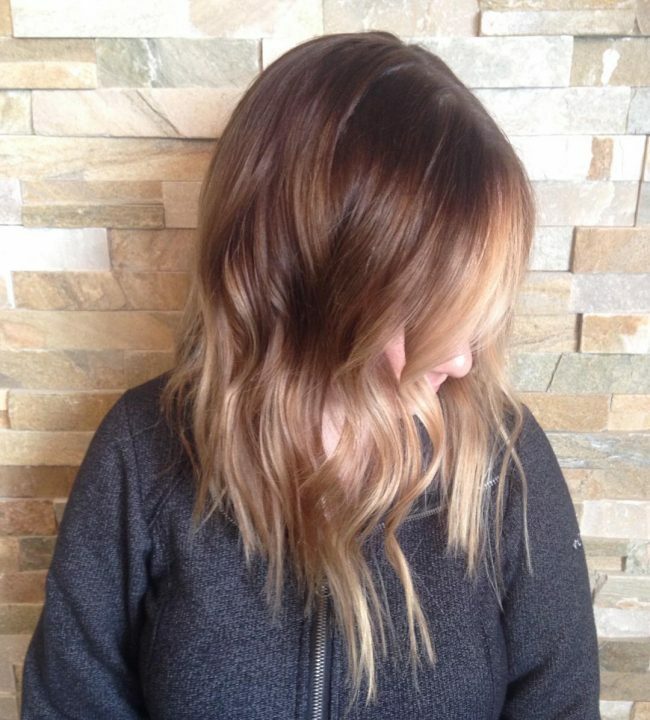 The shade comes from an ombre design that blends different shades of brown with a hint of blonde. The dark tone in this hairdo is fabulous, and it makes the curls look very classy. 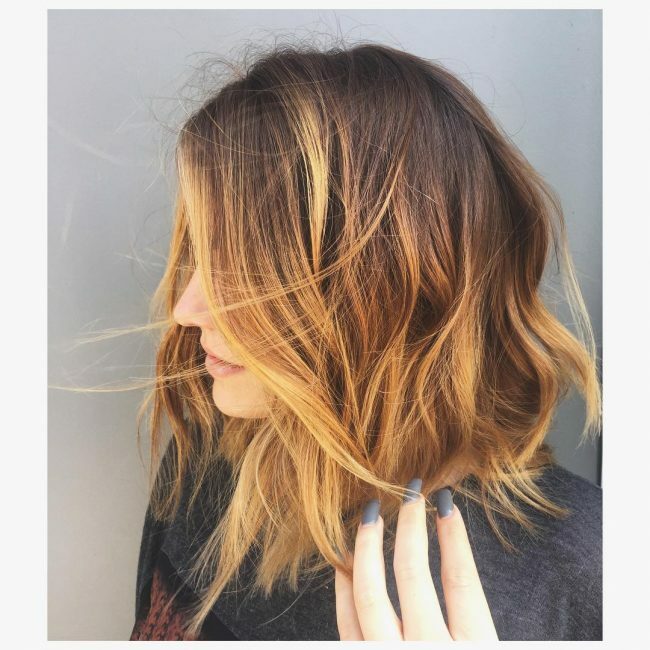 However, the cut in the design is also excellent, and it comes from trimming the strands carefully to give them some texture and styling them with a brush back and layering. 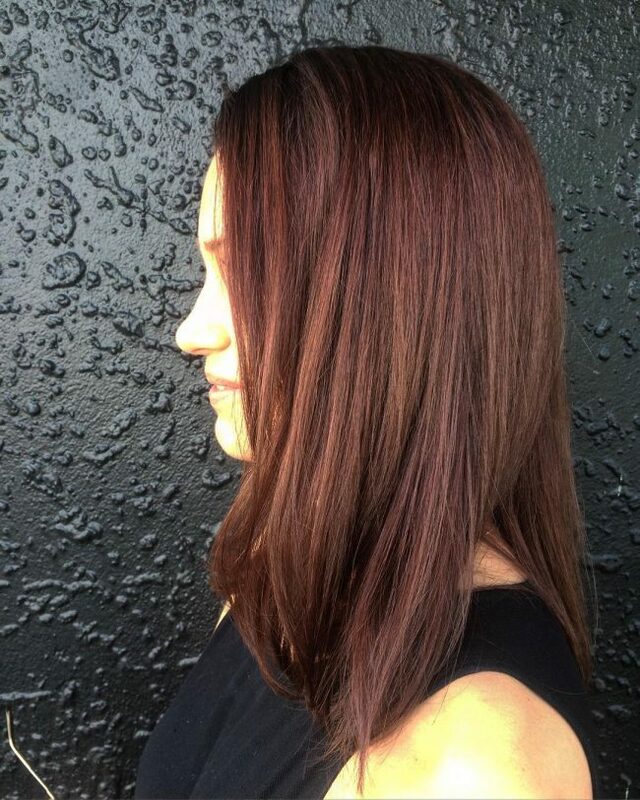 A Lob may be an elegant style, but it cannot look good without a lovely color. In this design, it gets its shade from some subtle light brown highlights on a dark brown base. 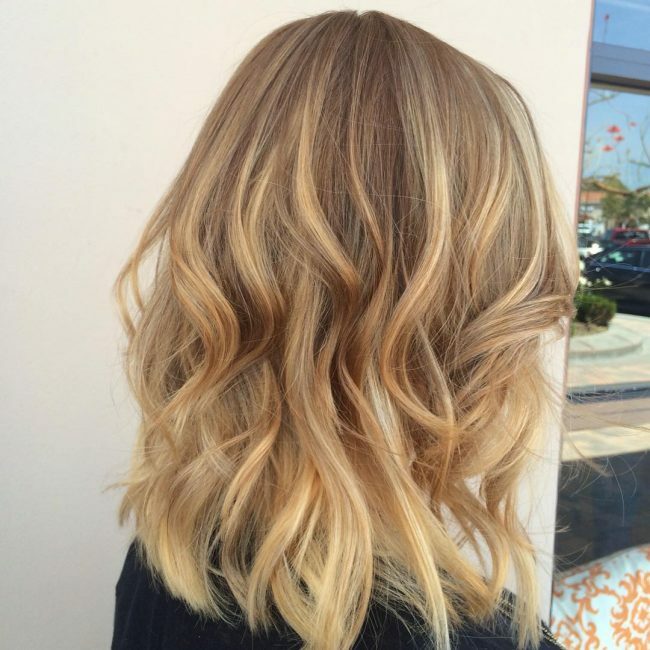 It also has some beautiful waves and a slight asymmetry that you can enhance by layering the strands. 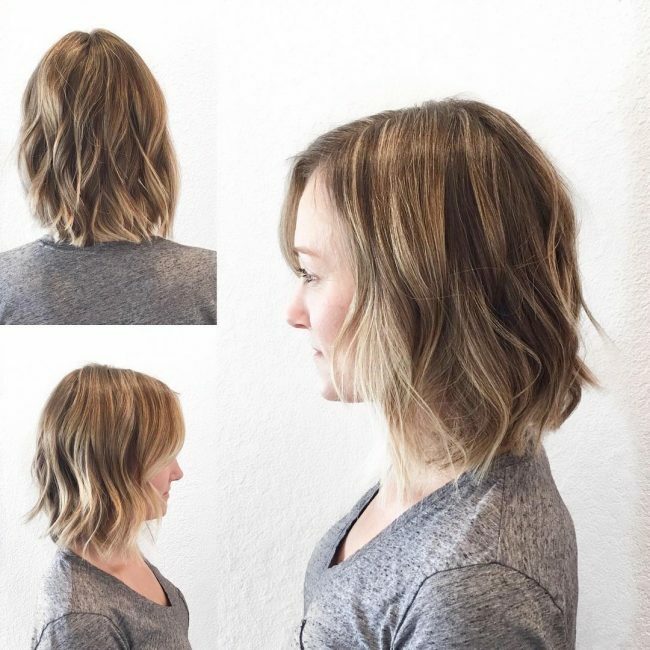 The most important thing in creating a long bob is the cut and color, and if you do both well, you will look splendid. This particular one has a simple angular look and a slight asymmetry which makes it look very edgy. 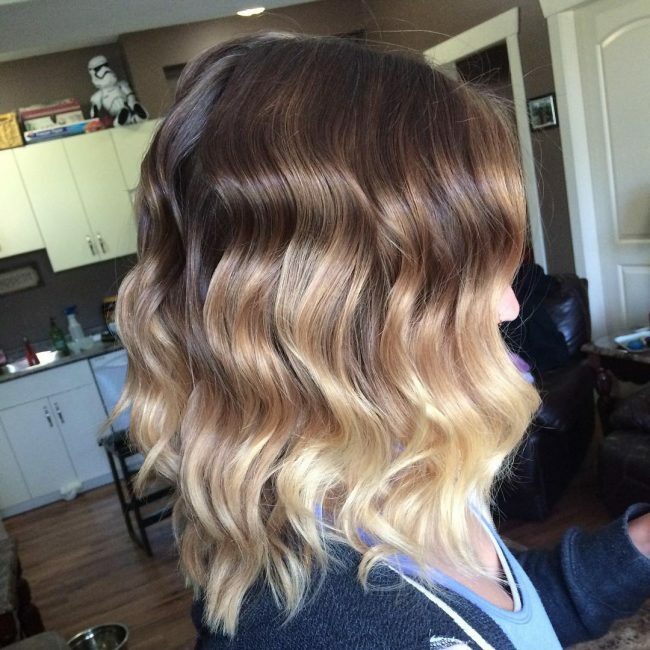 It also has some beautiful beach waves and a perfect color blend that gives it a pleasant tone. The shaggy look in this design is fantastic, and it gives it a natural finish. However, this is only one of the many things that make this design elegant. 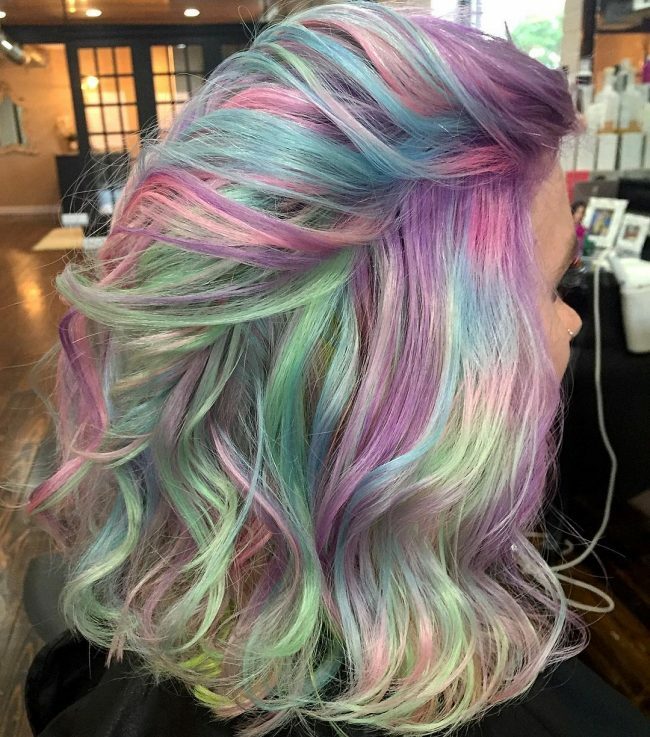 The others are its lovely ombre color and the perfect volume and texture. 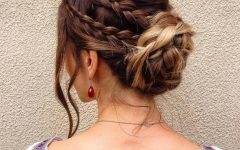 Although the strands in this hairdo are shorter than most others, they still create a fabulous hairstyle. They start with some decent cuts, and you should then part the strands on the side and style with slight layering. The chocolate to light brown Sombre shade also helps to spice up the look. 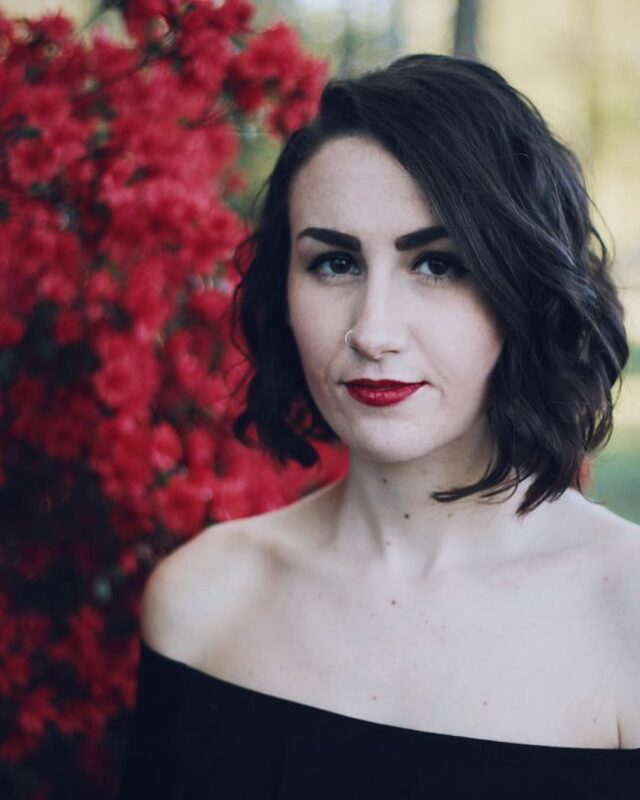 This face framing bob is very enticing, and you will want to chop your locks to try it. It is also very easy if you have some medium length or long locks. You should trim them uniformly, give them a brown ombre dye job and finish with a center part to create the face frame. The choice of color in this design is spot on, and it works perfectly with a light skin tone. Although platinum blonde is a magical shade, you cannot get the best from it if you do not have a fabulous haircut. And so the simple long and textured bangs in this design make the shade look magnificent. 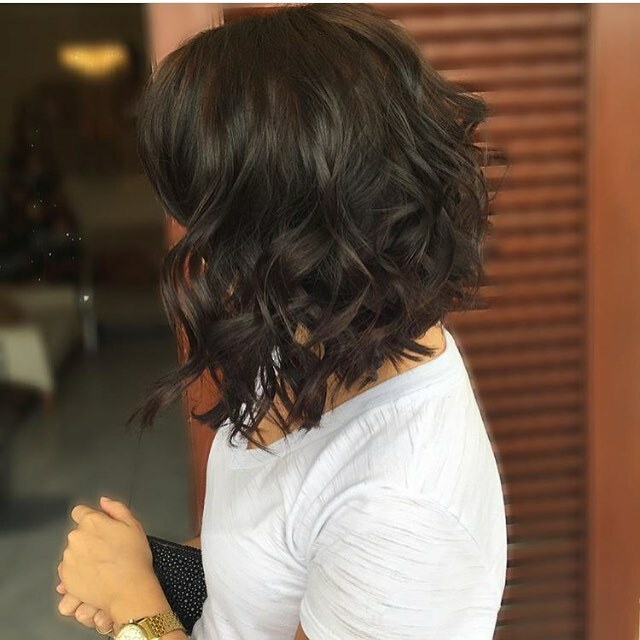 This short, charming hair is sweet and very simple, and so any woman can have it. It involves slight layering of straight strands from a side part, and with the ends cut for some uniformity. Although it creates a face frame, you should leave a few free flowing locks to give it a natural finish. 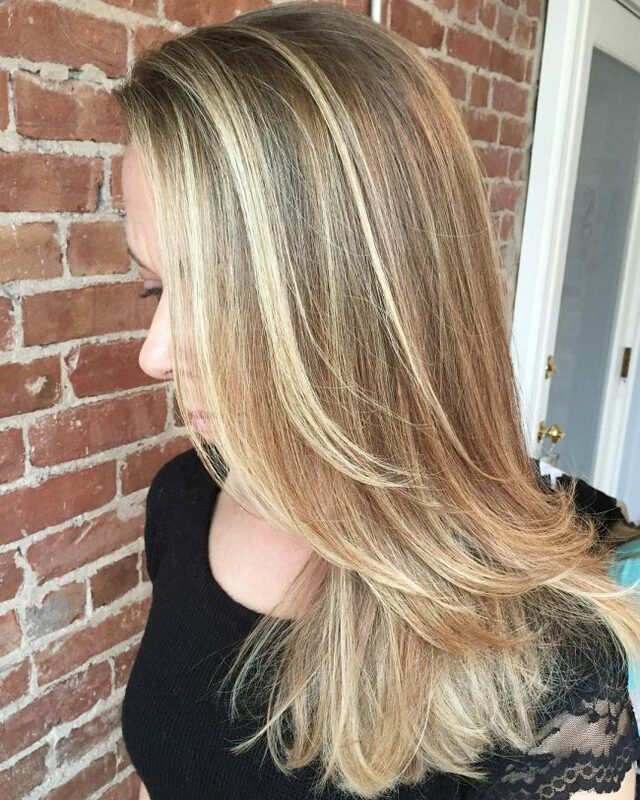 Blonde is a very popular hue, and the beauty of this long A-line explains this. The locks also have a neat cut that involves chopping the tresses to give them some texture. You should finish by brushing them back to maintain a natural look. The fun layers in this design will make a woman stand as they are very classy. And the good thing is that they are also very easy, and a skilled stylist will only need a few minutes to create them. However, you also need to have a fresh blend of brown and blonde hues to replicate this look. Shadowing your roots will not only give you some contrast but also help to create some dimension. 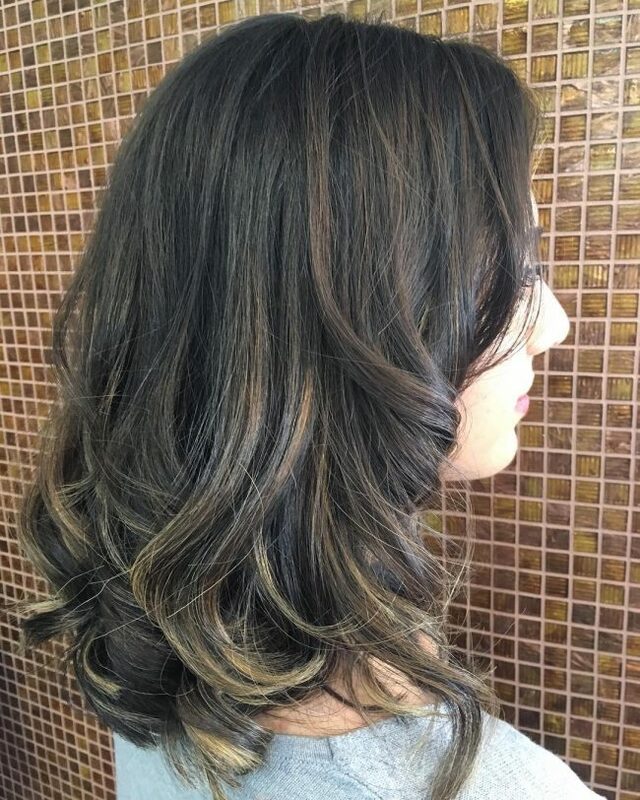 These long textured locks also have a lovely balayage dye job. Darkening the roots gives this bob some dimension and hence making it a trendy design. The level of detail in this headdress is amazing, and one can clearly see that the stylist took the time to ensure everything is perfect. Here the wearer has some thin strands with a shade of brown and the tips have a blunt cut. The hair also has a side part and simple layering to give the look a perfect finish. 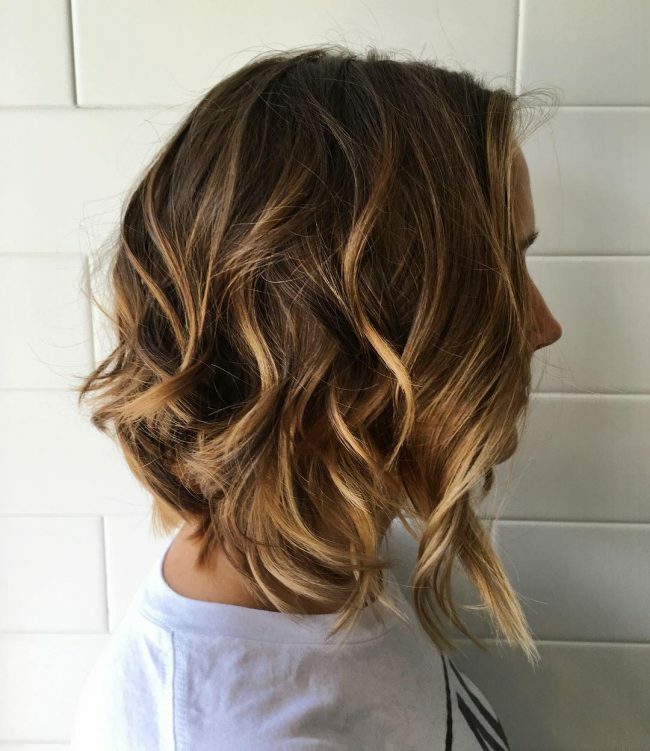 Even if you decide to go with a shorter Lob, you can still create a stunning look by using some lovely shades and having a good cut. The cut creates a nice texture and the golden hue on the strands adds some flavor to the overall appearance. This headdress is more of a short bob than a lob, but it still looks fantastic. It is a creation of trimming the locks to a couple of inches and then shaving the back or tapering it to create an undercut. The lovely blonde hue then adds some beauty and elegance to the headdress. It is hard to go wrong with any hairdo if you have a neat and fresh haircut like this one. 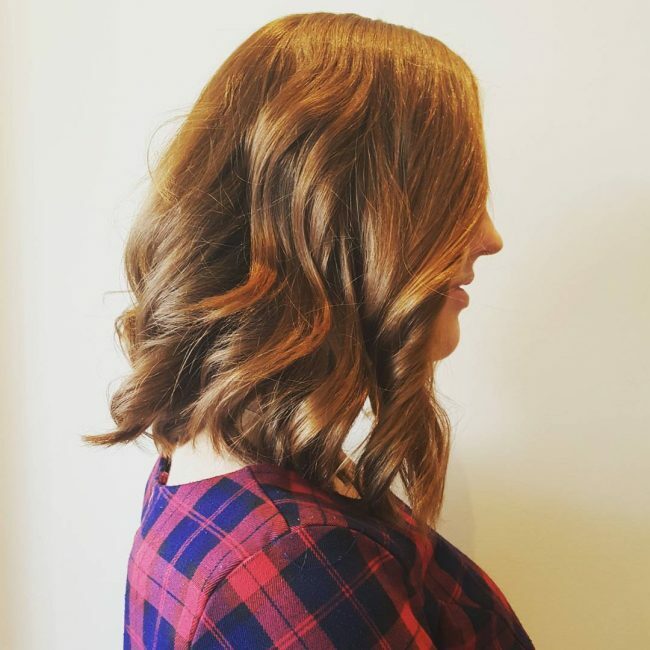 The chunky locks have a precise cut, and their depth and dimension are magnificent. 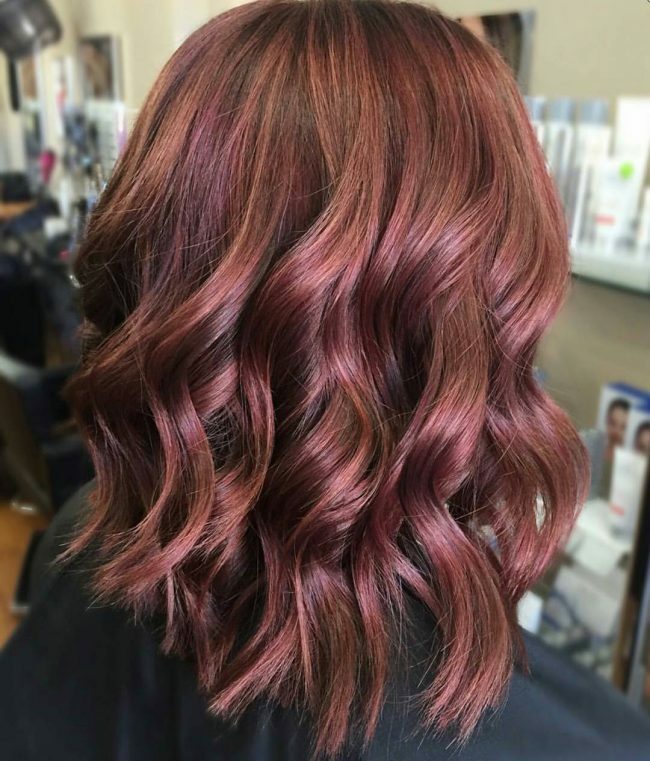 And the mahogany red shade gives them some top notch highlights. 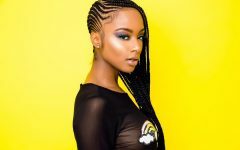 Some ladies have this natural sun kissed look, and so they do not need to use any color since a few trims, and an innovative styling is enough to give them an elegant headdress. However, anyone can still replicate this design by chopping and layering the locks and giving them some soft streaks. Something as simple as a fringe can make a big difference on your headdress. In this design, the small fringy bangs make all the difference as they give the bob some class. The locks are shoulder length, and they have some blunt tucked in ends. Apart from this, the stands also have a lovely ombre pattern that involves transitioning from honey brown to gray. 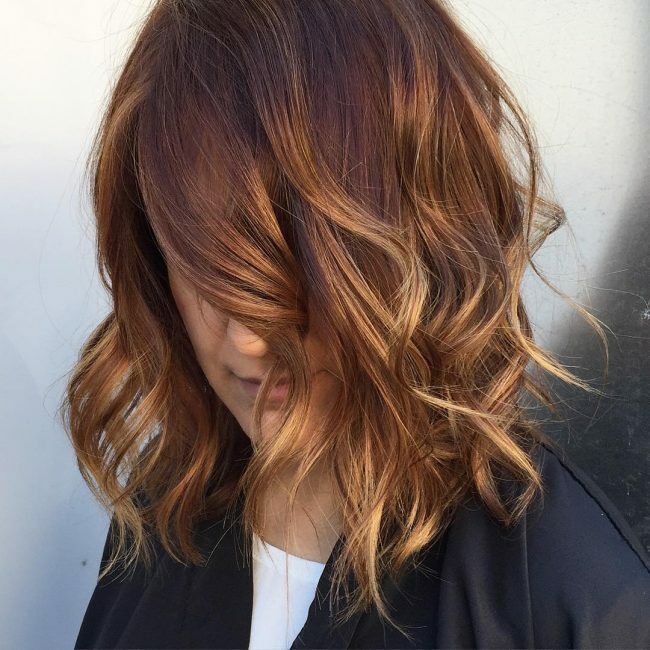 Caramel is a sweet hue and in this design, it gives the locks some eye-catching highlights. Although the color is perfect, the strands also have an excellent styling. The style involves layering then from the center part for an extra volume and to show off the lovely shades. 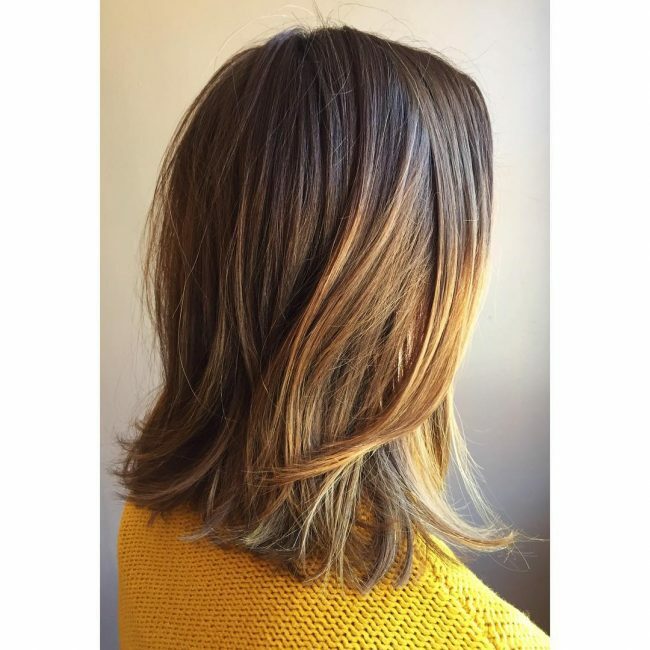 Warm shades will give your hairdo some dimension and if you have a lovely bob cut like this one you will look fantastic. The locks in this headdress have some subtle trims on the edges, and the warm brown tones are in an ombre pattern. They have a layered styling, and this makes them very easy to design. 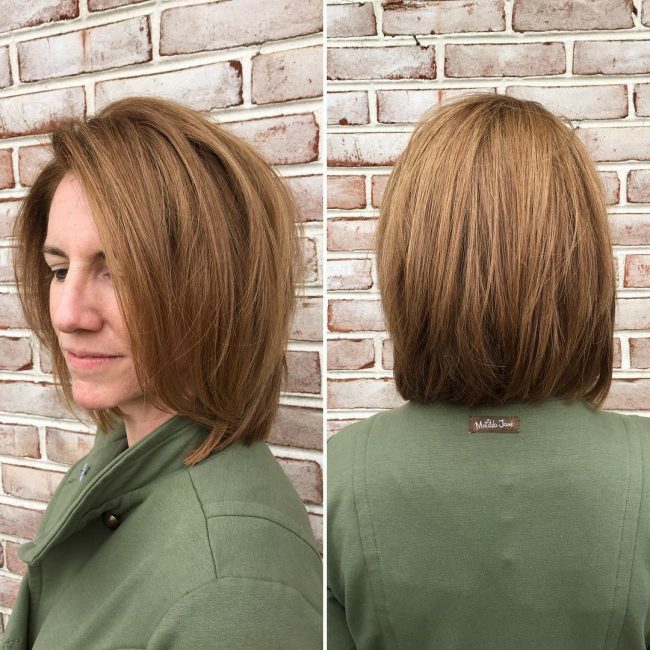 The transformation that the cut and color create on these strands is incredible, and it makes the A-Line look very modern. 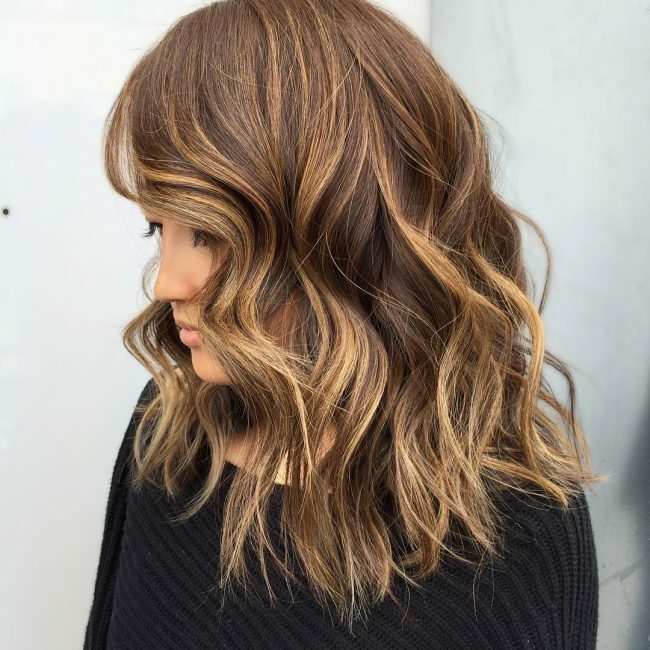 Just like with other Lobs the cut is a simple trim to create some uniformity, but the color is very detailed, and it involves hand painting a dark brown shade on the brunette. You should finish it by curling the ends to control the flow of the locks. 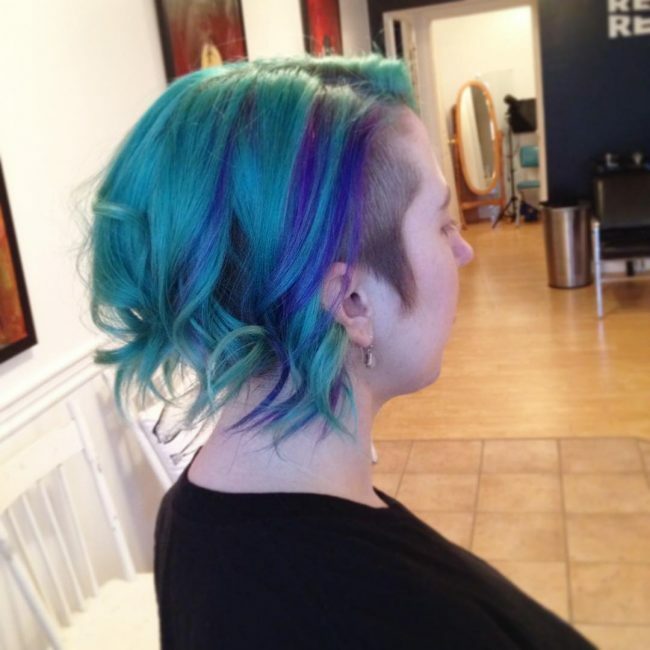 A pair of scissors in the hands of a skilled stylist can do wonders, and this style proves this. 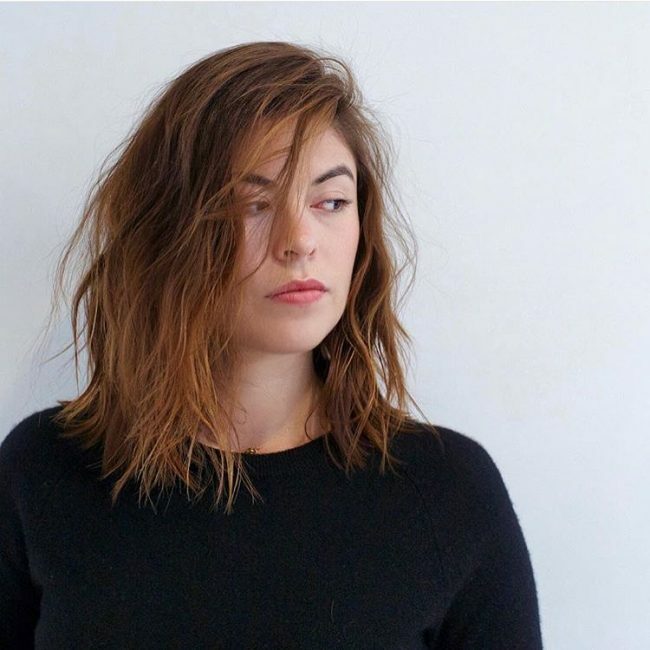 It has some sweet layered bangs and a neat fringe at the front that creates a unique long bob. 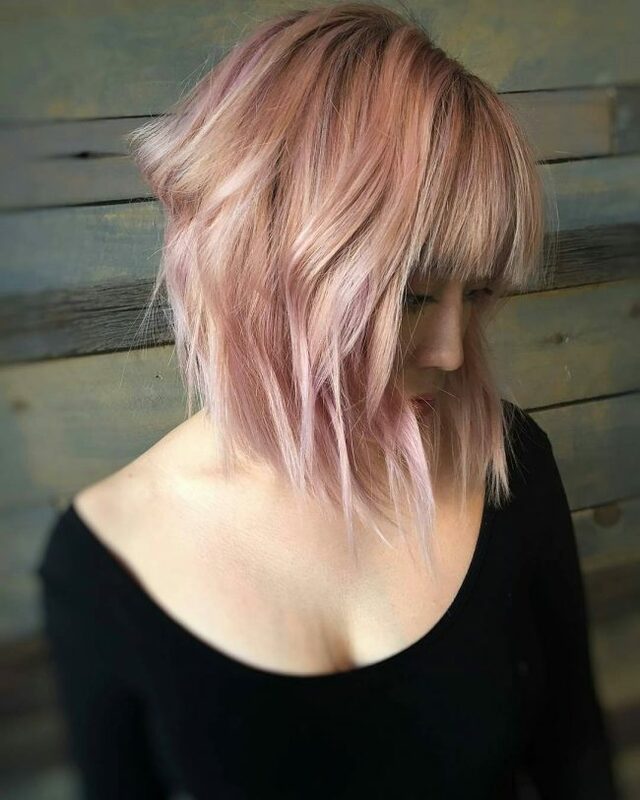 Apart from the color it also has some lovely shades of pink and rose gold to give it a perfect tone. An undercut can make even a simple hairdo to look magnificent, and this design proves this clearly. 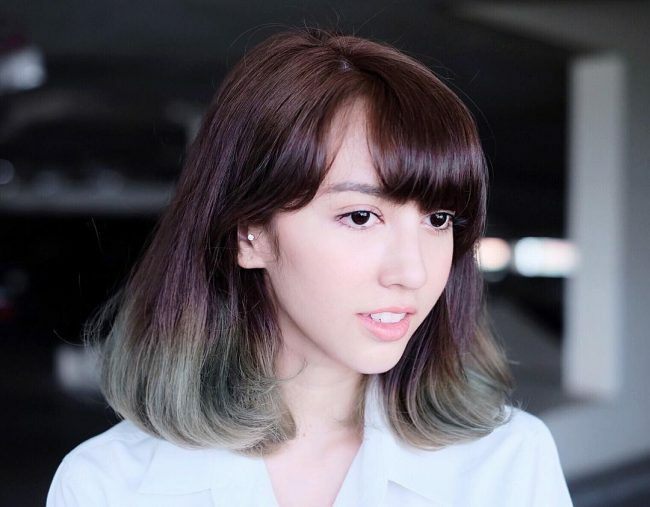 It has some long messy and voluminous bangs and an undercut that you can easily hide if you wish. 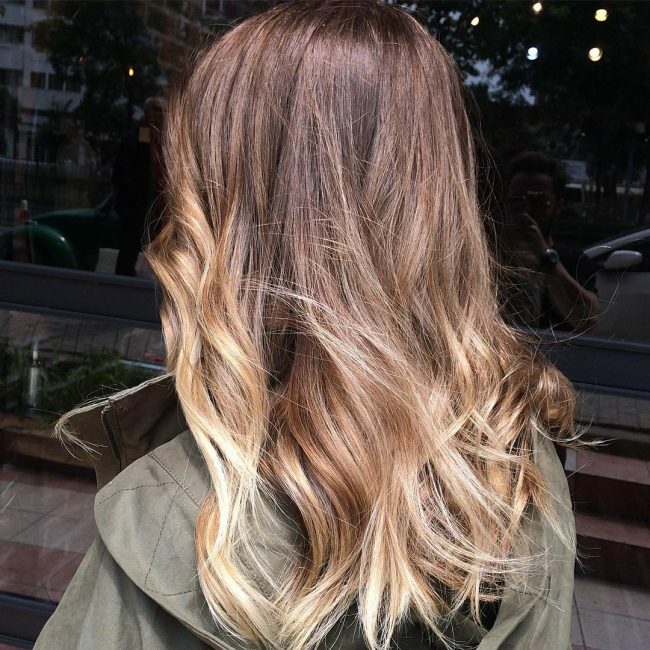 The shade of the hair comes from a chocolate brown to blonde ombre. Thin strands can still give you a stylish headdress, and you only need to come up with a creative way to cut and style them. 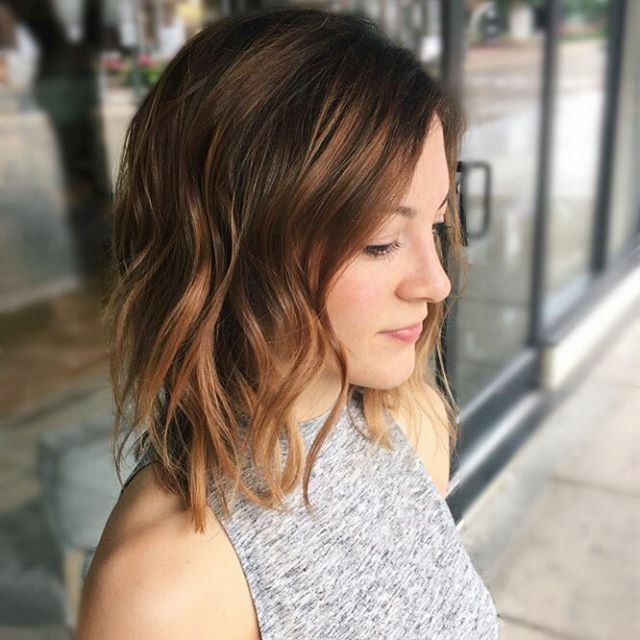 In this design, the thin locks have some lovely blunt cuts, and you should layer them to make them appear voluminous and to create the bob-inspired design. You do not always have to complicate your style to look trendy since a simple design can also give you an elegant headdress. The blonde locks in this particular design are simple, but they look very fashionable due to the texture and their layered styling. 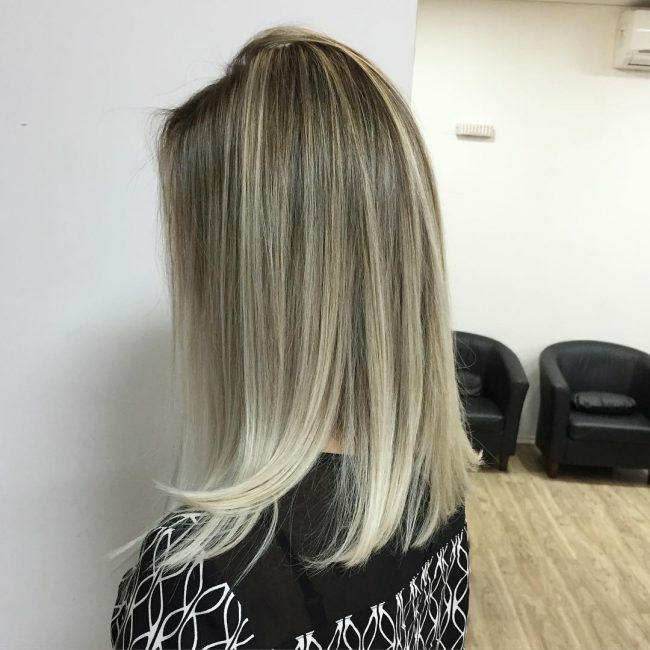 Their blend of blonde and the black base is also very charming. 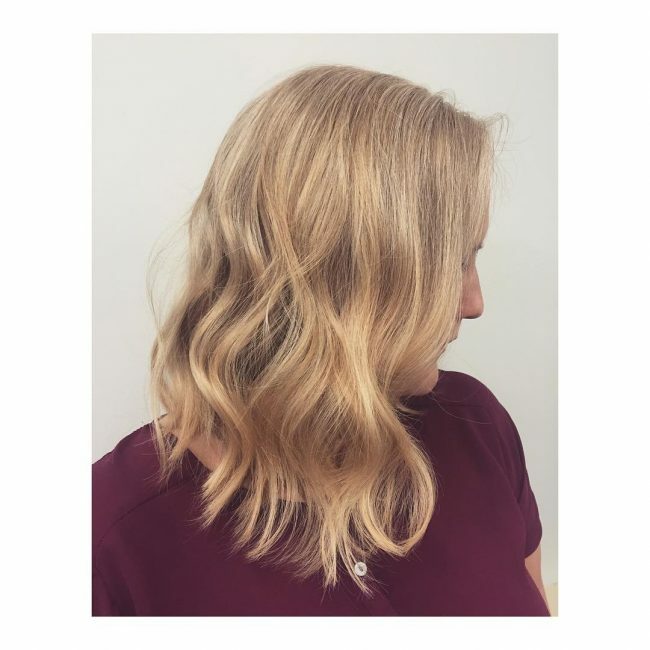 The beach waves in this style are perfect for your summer look, and they also have some class due to the rose gold hue. To replicate this design you should chop the ends of your locks and brush them back in some wavy layers. 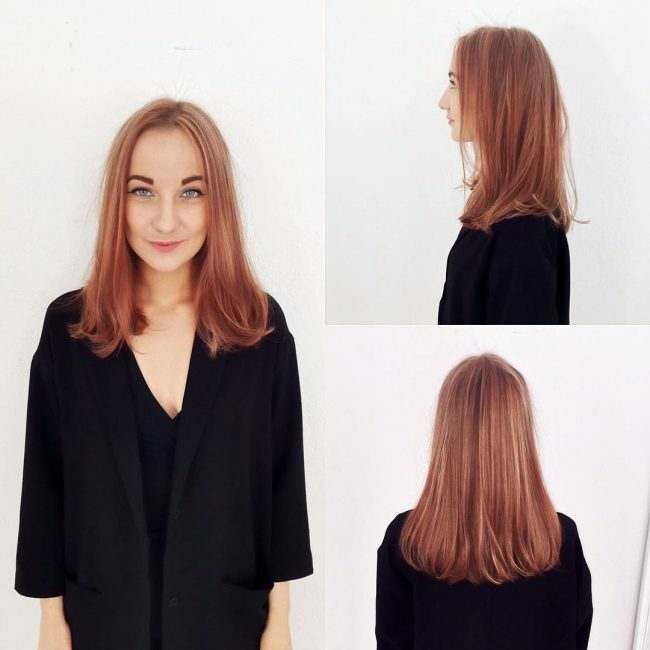 The rose gold has a hint of blonde, and you can achieve it effortlessly. Some sweet chunky strands like these will make a woman stand out from the crowd. To wear this look, you should chop your locks into some perfectly textured chunks. You should then finish by dyeing them with a red shade on a brunette base and style with a center part. 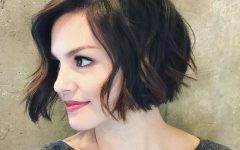 A lob is one of the easiest hairdos that a woman can wear, and in this style, it has some perfect chops and a stacked look. Stacking the strands from a side part is what makes it look this fabulous because this creates a face frame that accentuates the face. The tone is also splendid, and it adds a touch of class to the look. Few ladies if at all any would say no to a copper hue like this one. This headdress has all the vital things that define a top notch headdress with the texture and styling being the most outstanding ones. 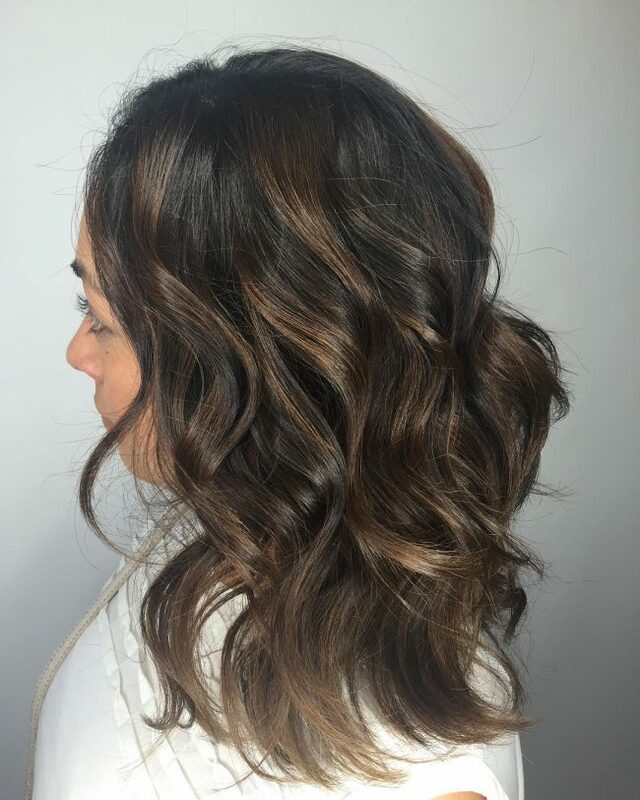 The copper hue is fabulous, and it blends in with the dark brown base color to create a perfect sun-kissed balayage tone. 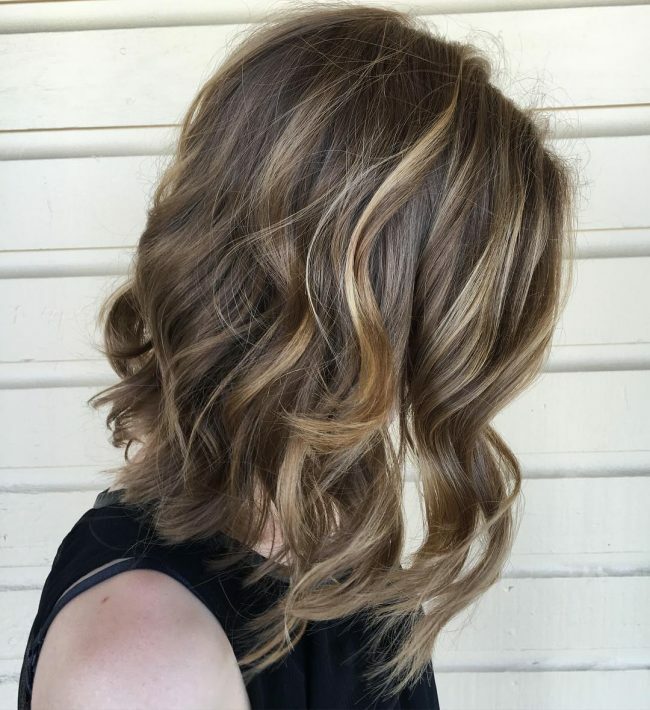 The subtle beach waves in this style are as elegant as it can get and they have a perfect dimension and depth that comes from a lovely color combination. 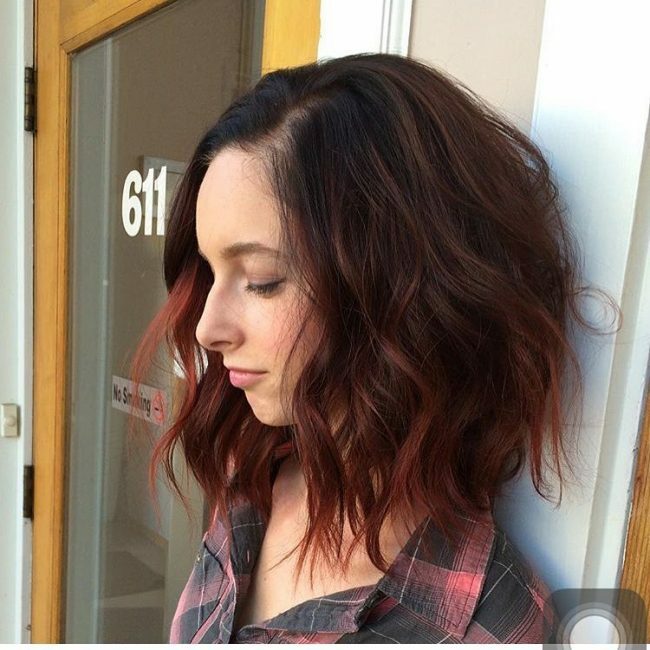 These locks also have an edgy look that comes from a beautiful cut and the layered design. The shades that give it the dazzling looks are in a Sombre pattern that starts with dark brown base and transitions to blonde. Baby lights have a soft appearance, and they always seem to breathe some life into an everyday style. In this headdress, they accentuate a long loose bob, and they also create a contrast with the shadowed roots. You should expose this pattern by styling the locks with a center part and side sweep. The color is what will draw you to this style, but there is still much more to it than this. Apart from the green tone with purple peek-a-boos the short strands also have a beautiful undercut with a cute tapered pattern. 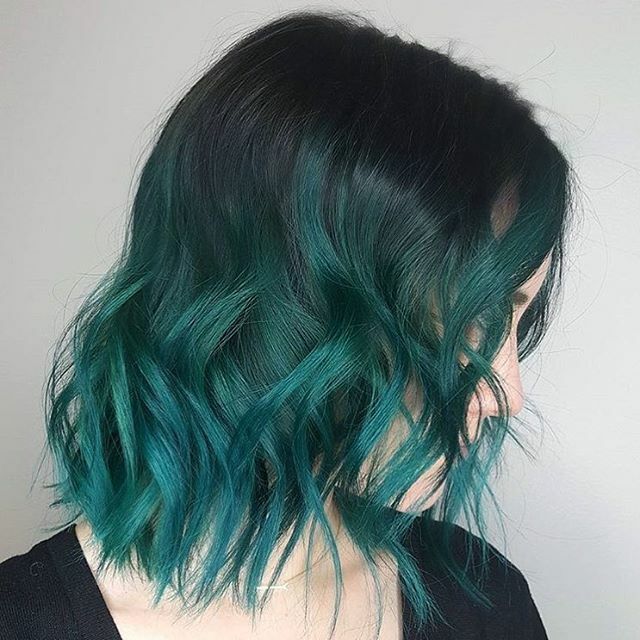 Jade green is a unique shade and so with it on your hair, you can be sure of a distinct look. In this design, it is in an ombre pattern, but the cut and its style are also fantastic. The haircut is a textured bob that you should style by layering your hair to the sides. 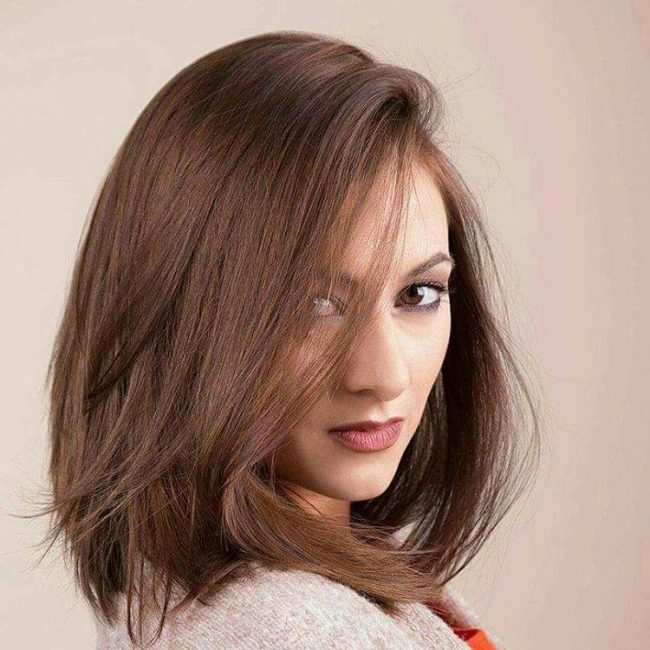 This bob cut is very sleek, but it still maintains an airy look. It has a lovely asymmetry that makes the straight and smooth strands look exquisite. 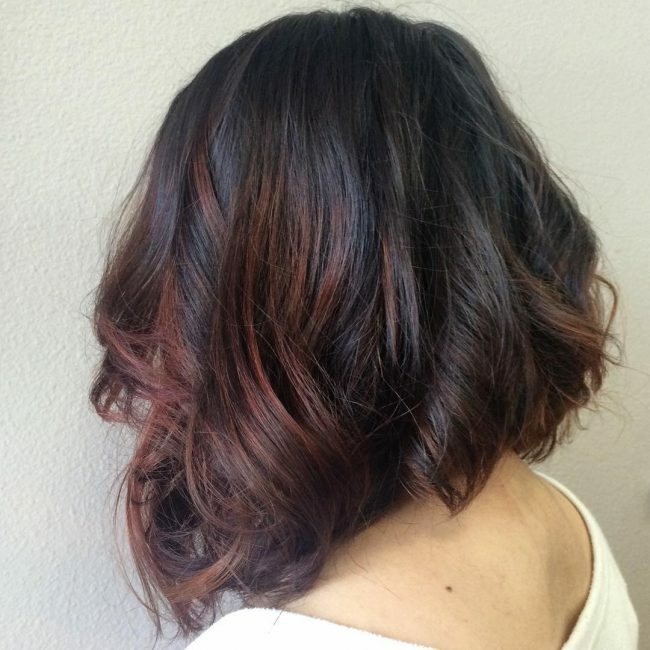 The balayage color melt is also splendid, and it gives the design an excellent tone. A long bob is a beautiful headdress, and it is worth chopping your long locks to create one. This one has an excellent volume, but the cut and its lovely texture are what make it outstanding. It has some simple trims, and you should style it by stacking the textured strands. The color is also fantastic, and it is a honey brown with partial light brown streaks. This design is another example of how you can create a stylish look with your thin strands. It involves parting the strands on the sides and layering with a side sweep. You should also make them messy so that you can draw attention away from their thinness. Their copper hue is also fantastic, and it is in a soft Sombre pattern. Wavy hairs are very flavorful, and they can give you a top notch look if you cut and style them right. In this style, all that you need is to chop the ends for some texture and then design them with a center part to create a face frame. Their smoky tone is also amazing, and it helps to enhance the appearance. The asymmetry that the brunette strands in this design form is amazing and it will make a woman look magnificent. Apart from this shape that comes from inventive trimming, the strands also have a lovely stacked styling with a soft side part. The hint of chocolate brown also helps to give them an excellent tone. 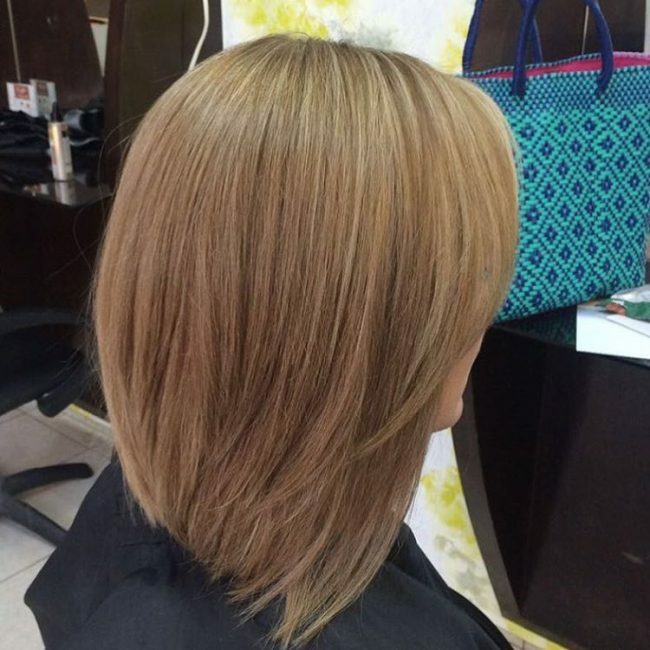 A bob cut is always about the haircut, and so you cannot afford to go wrong with this. This particular one has some outstanding blunt cuts that look great when you brush it back. It also has a smooth style and a soft side part. The blonde shade is also perfect, and it seems to work fine for the light skin tone. 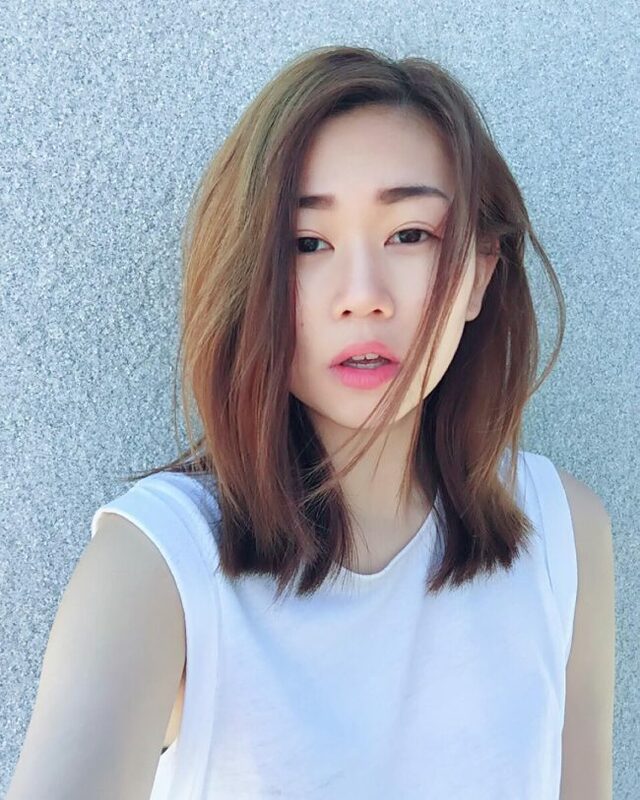 Although this is a typical Bob with some blunt cuts at the back and a face frame, the color makes it look distinct. It is a lovely rose gold shade but it has a hint of strawberry blonde, and this makes it look different. However, the texture and volume also help to enhance this look. This headdress is very natural and effortless and this is what most ladies will love. It has some nice textures, and the locks are longer than what most people expect in a Lob. The styling is also fantastic, and it involves layering the strands from a center part to create an extended face frame design that covers the eyes. 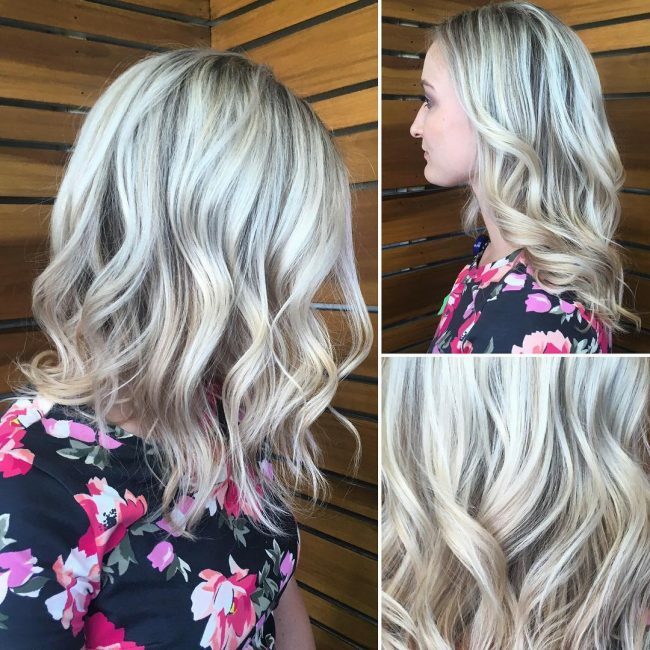 Blonde is a beautiful hue that will make you look very elegant and stylish. In this style, it is in some lovely choppy bangs that also have some beautiful swirls. The styling of the locks involves brushing them to the sides from a soft part line and maintaining their smooth wavy flow. The vivid color in this design is a blend of browns, and this gives it a very distinct brownish shade. However, the style would not be complete without the cut, and it involves chopping the strands to a couple of inches. You should then finish the look by tucking the ends. This headdress is as straightforward as it looks and so you can achieve it easily provided you have some smooth straight locks. You only need some moderate trims and a simple layered design. 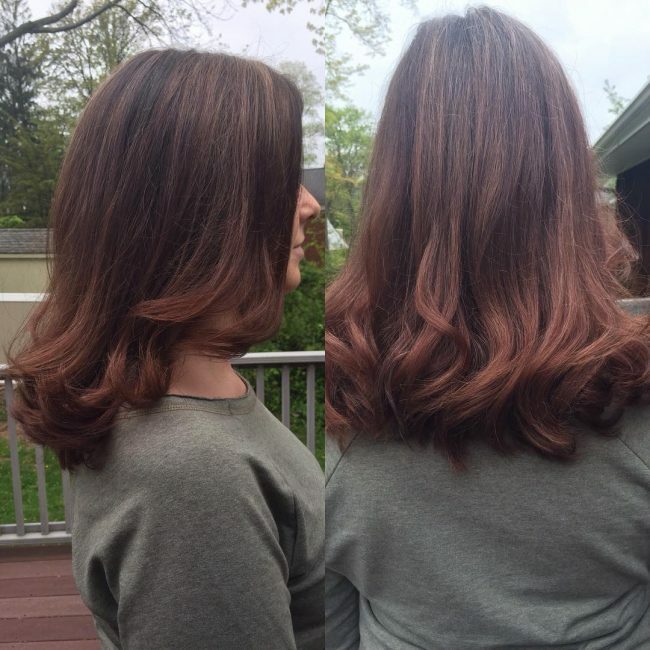 The shade is also vital, and it is an attractive chocolate brown that you can achieve effortlessly. 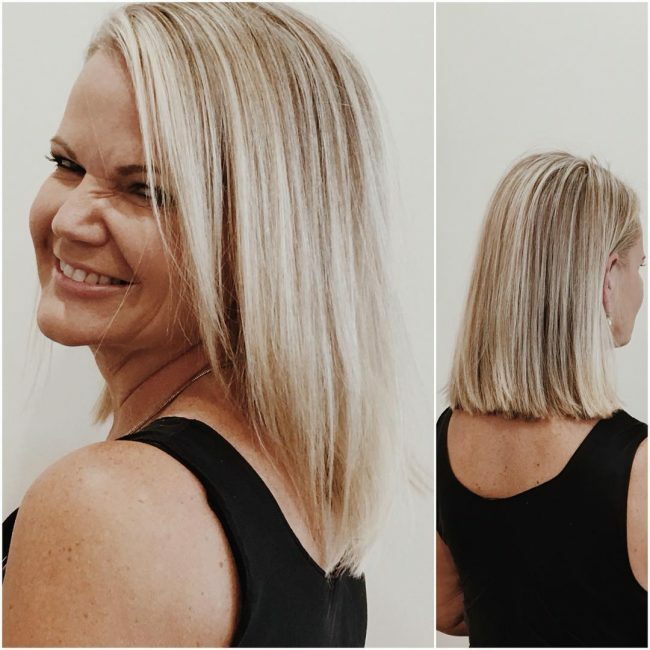 The pure blonde shade in this design is in a beautiful Sombre pattern that makes it look fantastic, but the design would not be complete without the haircut. 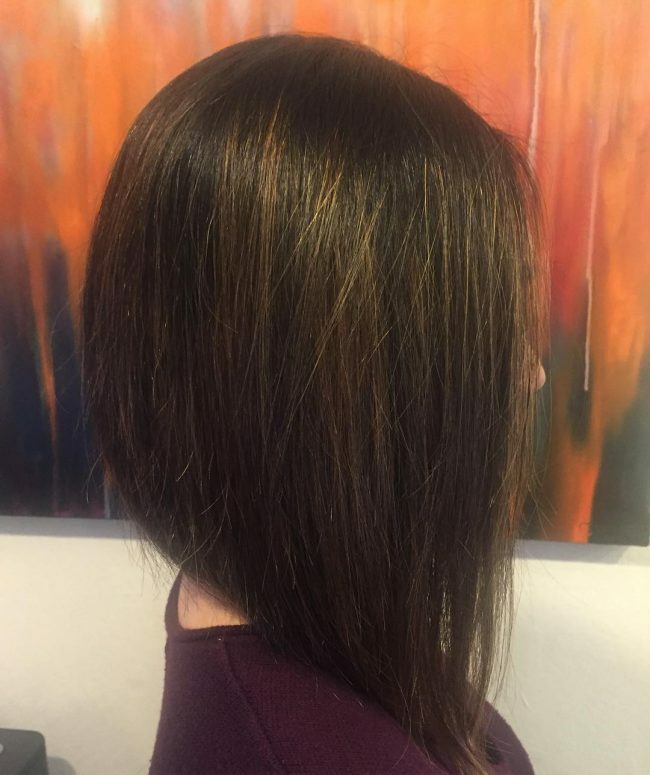 It is a traditional textured bob cut that you should style with a center part and simple layering of the locks. Angular haircuts are very trendy, and they are a perfect idea for ladies who want to keep up with the times. This particular one also has an edgy look, and it comes from chopping the strand in an asymmetrical pattern. You should then style by layering them softly from a center part. The shade of brown is also very attractive, and it makes it look classy. 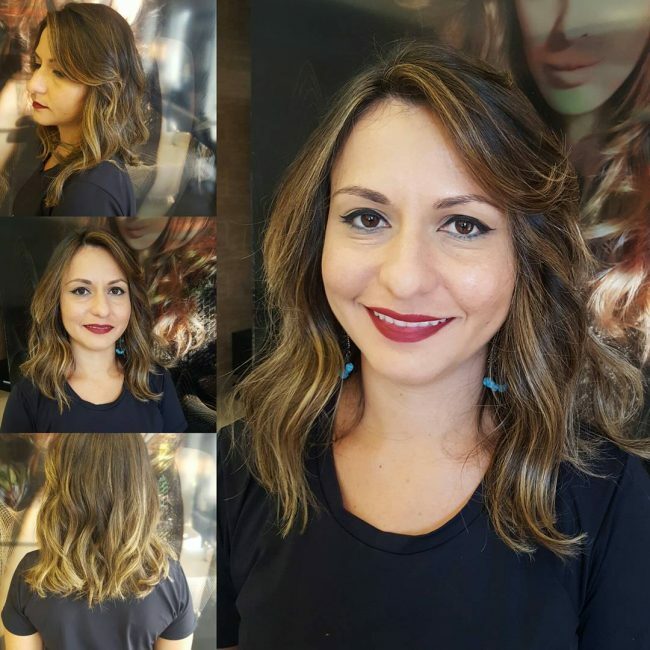 Some ladies prefer to keep long, voluminous locks, and so this style will be perfect for them. It has some long wavy strands that have a top notch cut and styling. The haircut involves chopping them for some texture and the styling is an inventive diagonal side sweep and layering. These locks also have a smooth hand painted dye job with some blonde highlights. 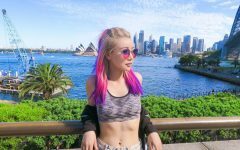 The technique that you use on your style determines how attractive it will look. 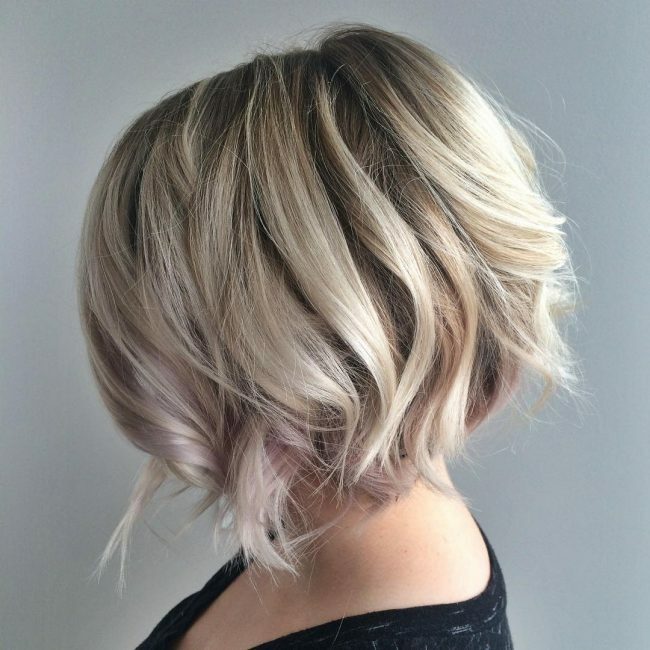 This short crop cut has some unique textures that come from an inspiring scissor trim. And although the strands are only at the chin length they still look fantastic, and their dark tone is also excellent. A Bob is a very classy headdress, but this one looks much better than most others. And this is because it has nice choppy cut and a fresh color. 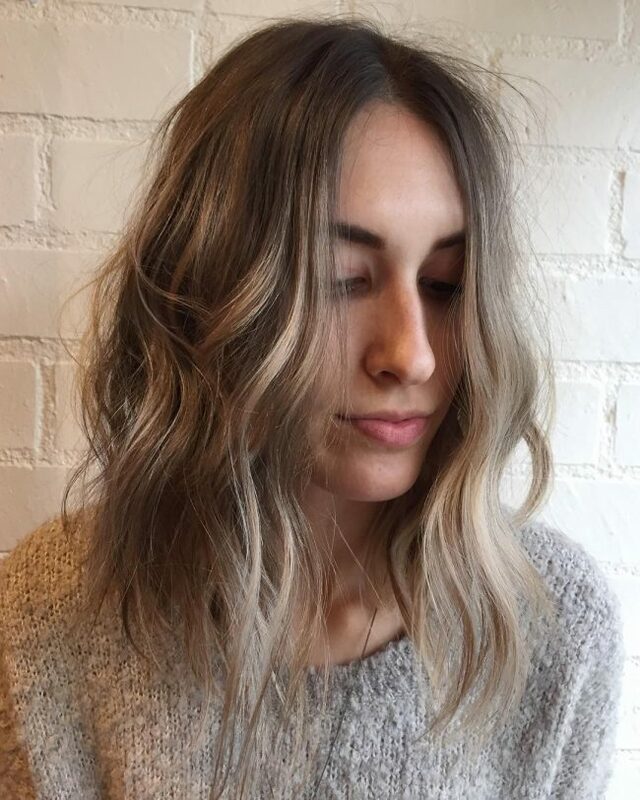 The tone comes from a pop of blondes with the ashy hue being the most dominant. There is also a Sombre pattern in the design that adds some dimension to the headdress. Jennifer Lopez has been in the limelight for many years, and so there are many looks that people associate with her. This shoulder-grazing lob is one of her most famous looks, and it has a lovely face frame that adds some detail to her facial features. She also has a beautiful shade of brown that adds to the beauty of her style. Rachel McAdams rarely goes wrong with her headdress, and even something as simple as this choppy bob still makes her look fabulous. 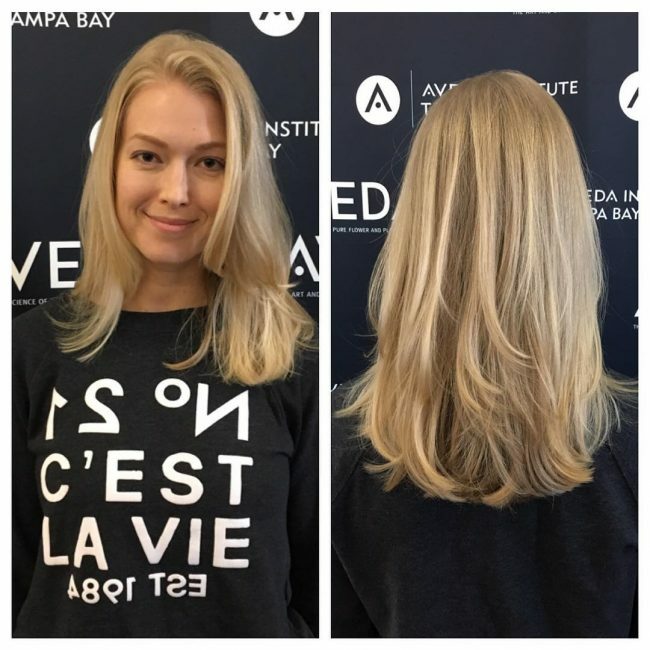 She has a lovely cut that gives her design some texture and all that she needs is a simple center part to finish the elegant look. 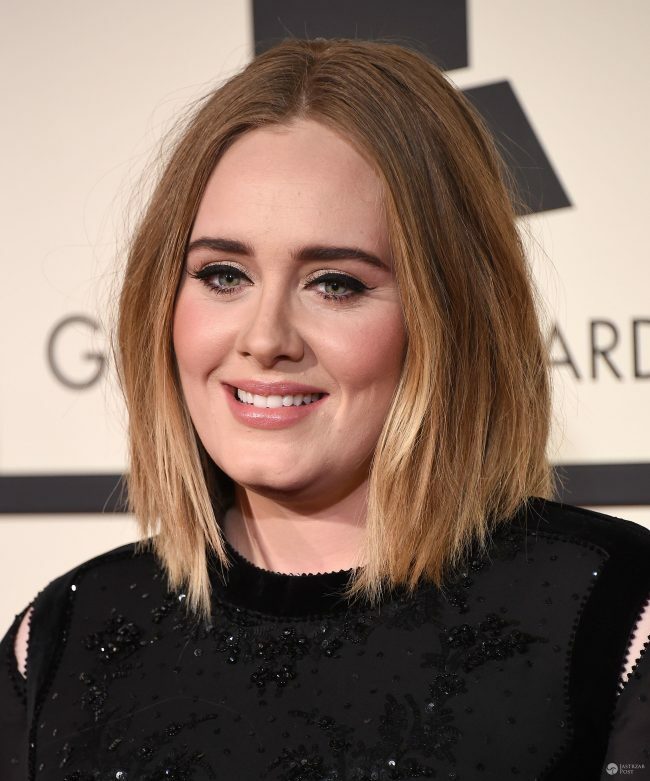 Adele likes to keep things simple, but she still looks magnificent in all her style. Here she has a simple but trendy sombre bob. Although its color is what catches most people's attention, the style also has an excellent cut with blunt tips and a medium volume. The shine on this headdress is magnificent, and it makes Taylor Swift look very stylish. 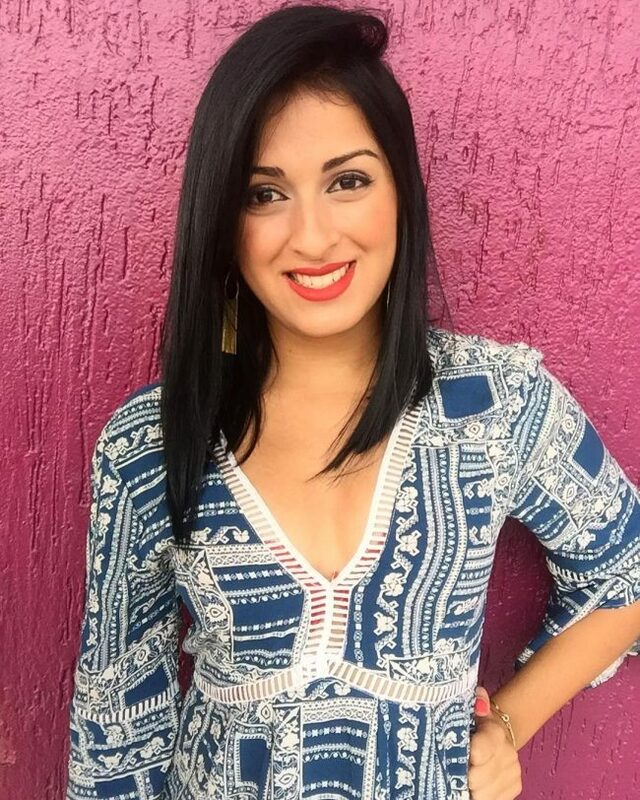 Although she does not have very voluminous hair, she styles her strands with a beautiful center part and side sweep to give them an extra volume. The waves on her strands are also incredible, and the shade gives them some depth and dimension. 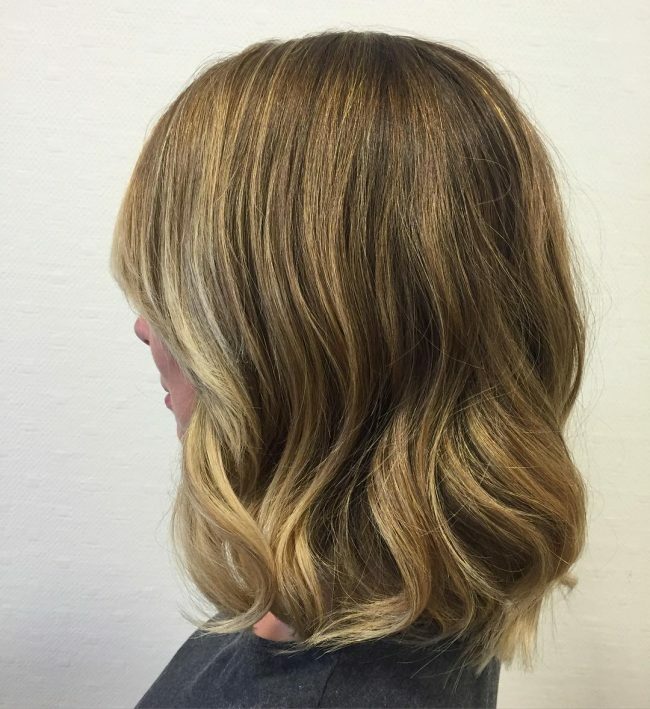 Everything about this bob is perfect, but the number one thing that makes it stand out is the caramel tone. 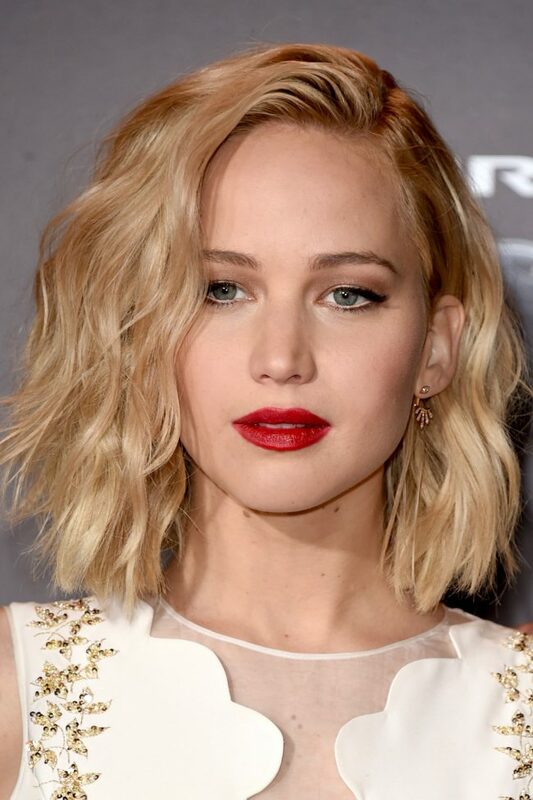 In this style, Jennifer Lawrence has regular trims but her strands are very wavy, and she styles them inventively with a side part and side sweep. She also has some slightly shadowed roots that create a lovely contrast with the caramel hue. 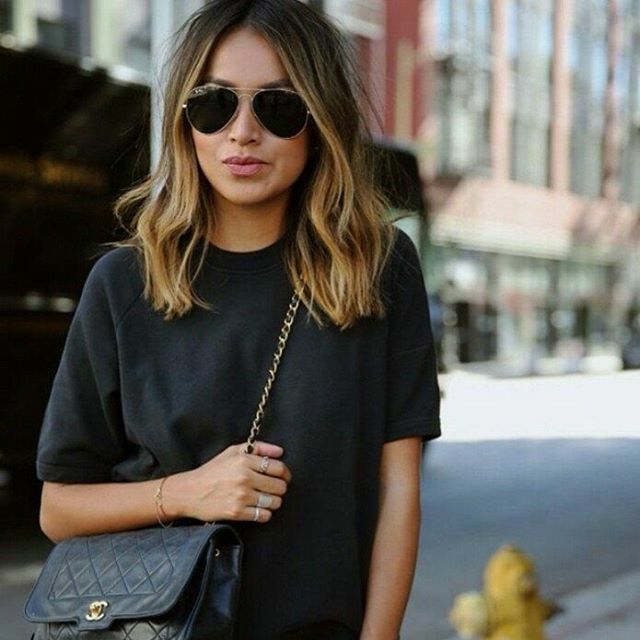 A long bob will never go out of trend because there is always a new styling option coming up. Whether you like complicated designs or simple ones, there is still an option for you. The 60 styles above are some example of the elegant looks that you can achieve. And so you should try them out if you are looking for something that will make your short strands look marvelous.